Linking Old World and New Vision - Fresh, Local Breakfast, Brunch and Lunch. 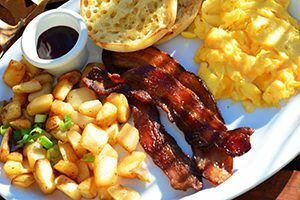 Egg Harbor Café’s all-natural bacon and sausage are made by Jones Dairy Farm in Ft. Atkinson, Wisconsin, a family business whose home-grown recipes have produced top quality products since 1889. Company president Philip Jones is a sixth generation family member and classically trained chef who applies old world culinary techniques while implementing the highest production standards. Sausage is ground in small batches. Spices are hand-weighed. Bacon is dry-aged and naturally smoked, just like the early days. At the same time, state-of-the-art production and lab equipment assure that food quality, safety and flavor are consistently best in class. Jones Dairy Farm treats its employees like family. Their excellent work environment and safety standards have led to very low turnover, with multiple generations of family members employed throughout the company. Jones Dairy Farm also values animal welfare, and only works with quality suppliers who meet their high standards for animal housing, nutrition, transit and generally humane treatment. Jones Dairy Farm products have consistently high quality and flavor that we are proud to stand by, and our bacon and sausage lovers enjoy the rewards. Come in soon and taste the extraordinary flavor of our all-natural bacon, sausage links, chicken sausage and turkey bacon!